Anyone who follows me on Twitter knows that I was very disappointed when I saw the almost entirely humorless Transparent won Best TV Comedy at this year’s Golden Globe Awards. Anyone that I am friends with on Facebook know that I find the more bizzare-than-LOL homage to Woody Allen named Louie on FX to be more a testament to Louis CK’s work ethic and enjoyment of Allen’s films than actually funny. And then there is HBO’s 800 lb Gorilla (no not Lena Dunham, but Girls, the show that generates more smirks and whimsy than laughter). All that seems left for critics and comedy awards to gush over is if Wes Anderson decides to bring his quirky, critically acclaimed nonsense to a Showtime series before television comedy can finally usher in the apocalypse. It is really time for some of these “comedies” to start getting a new category saved for people who are occasionally humorous, but cannot compete in the realm of full comedy: spoken word shows. To put this in perspective, imagine that there were stand up comedy awards and the nominees were Bill Burr, Dave Chappelle, Henry Rollins and a Steve Martin art discussion. Two of those are comedians. One is a guy who rants for an hour and occasionally throws in a joke to amuse a crowd while they are not in awe of his re-telling of adventures that show how open minded and worldly he is. And the last is a comedian who is not doing comedic things. Well this appears to be happening in TV, as shows that are not particularly funny (I deem funny by the ancient test of “does it generate laughter”), but clearly cannot compete in the age of incredibly great dramas, are being allowed to hog some of the spots for best comedies. 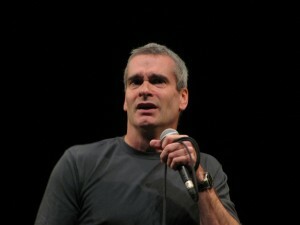 By Emmy and Golden Globe standards Henry Rollins would be a stand up comedian. For example HBO – Veep has lots of laughs and gets critical and award recognition. But Hello Ladies or the 1st season of Eastbound and Down got nothing. Can anyone reasonably tell me that they laugh more at an episode of Girls than at Hello Ladies or Eastbound and Down? To say nothing of the fact that those shows are actually just better shows, they are certainly better at generating laughs. I understand that there are reasons why Ace Ventura: Pet Detective did not get nominated for Golden Globes for Best Comedy – it is funny, but it is obviously not a “good” movie. Tone Loc and Dan Marino are rarely going to have large speaking roles in high quality entertainment. So I understand that there needs to be a quality threshold to be considered. But once a show meets that threshold then humor should be the deciding factor. HBO is not alone. I just recently mowed through 4 seasons of a long running comedy on FX It’s Always Sunny in Philadelphia. The show is absolutely hilarious. Please correct me if I am wrong, but I do not think it has ever been nominated for a Best Comedy Emmy. Perhaps the network is ignored? Well, that is not true because Louie continues to compile nominations (as well as wins – hey if Louis CK can win for playing himself then why didn’t Eminem win for 8 Mile?) for best comedy even as the show continues to generate fewer and fewer laughs (and viewers). But on a humor scale it is not even close as to which show is funnier. Workaholics on Comedy Central also stands out for me. Admittedly I have found the show inconsistently funny over the last 2.5 seasons, but when it hits, it hits huge, which you would think might generate a writing nomination (for an episode), but not when Girls is generating at least 4 smirks per episode! Two episodes of Workaholics have more laughter than 4 seasons of Girls. And then we arrive at Transparent, which may be the apex (or nadir) of this humorless comedy movement. The show is a critical (and I would say Hollywood liberal) darling because it stars a usually hilarious Jeffrey Tambour and is the first show to have a transgender character driving the narrative. I laughed 3 times during the 10 episodes of Transparent‘s first season. What makes it even more bizarre is that Transparent is the 3rd comedy on Amazon’s video service and it is overwhelmingly the least funny of the three (I strongly recommend Alpha House and also recommend Mozart in the Jungle). Despite my critiques of stand up I am actually a relatively easy laugh, especially by the standard of stand up comics. But that show, which I watched half of the weekend it went up on-line (so I was not biased by any awards) and found it annoying. But even allowing for difference in tastes, it just was not very funny. Even half of the people I have engaged with on social media over the show who like it admit that they don’t think it really qualifies as a comedy. But once again, what is easier to challenge for awards – Breaking Bad and Game of Thrones or Girls and The Big Bang Theory? So now we live in a world of comedies that don’t make people laugh, but rather think and smirk? The question is why? When did laughter, even in awards that have categories to honor comedy, become a handicap instead of a strength? I would argue it is what happens when a culture begins to cater to hipsters and nerds. Comedy is not jazz!!! It is not the laughter you cannot hear that makes it fun! But I think the need to create your own sense of cool and to reject the mainstream and “know more” or have inside knowledge has given rise to these comedies that are the laughter equivalent of The Emperor’s New Clothes. In an effort to cater to the cool kids of the day shows that are unfunny except to people who hate the sound of out loud laughter, these shows have cut a far too large slice of the comedy award pie. So hopefully the pendulum swings back soon. It is bad enough the Oscars tend to not honor comedies (though seriously shut the fu*k up if you thought Bridesmaids deserved Oscar recognition) but in awards like the Emmys and Golden Globes it is time to give actual laughter more weight in determining what makes a worthy comedy.